This elegant old apartment is situated in Eixample, a beautiful part of central Barcelona known for its stunning modernist architecture. The home has high ceilings, original Catalan floor tiles and tall, narrow windows typical of the area. 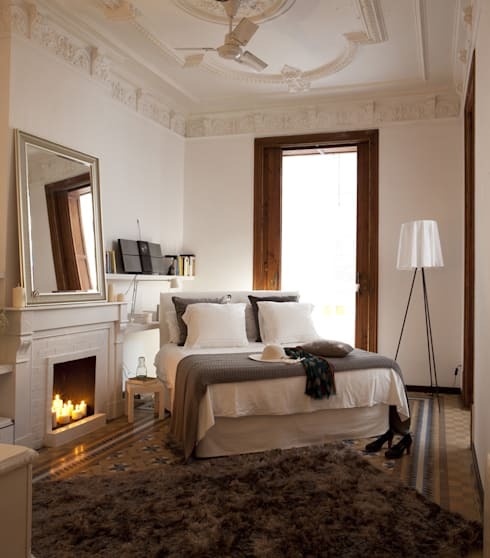 Many of the stunning old homes in Barcelona have fallen into disrepair, so it's wonderful to see this elegant old home refurbished with care. Few elements define Catalonian style like dark grey. The designers here have used it liberally to create a rather stately decor in the living room. This is perfectly suited to the high ceilings and aristocratic feel of the home. Note how the long pendant lights over the rustic wooden dining table help accentuate the height in the room. 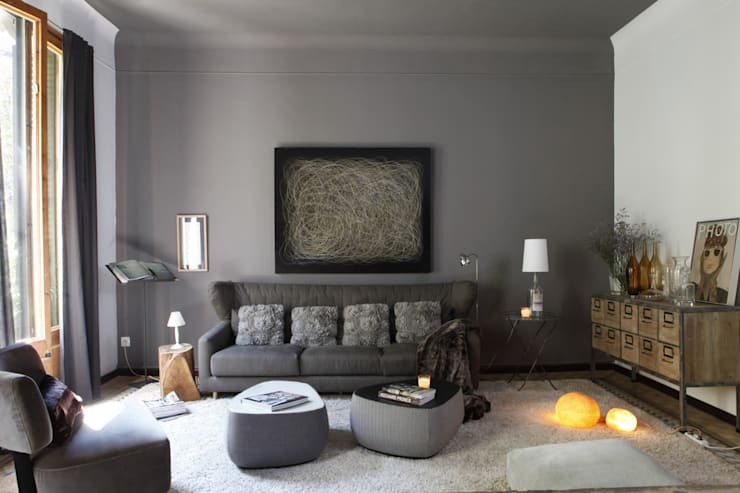 The grey living room feels rather creative and modern. The furniture and coffee tables come in a myriad of soft and varying forms. The abstract artwork on the wall fits beautifully into the monochrome colour palette of the room. The home also has a relaxed ambience. Here, the designers have created this look with sparse, low-set furniture. See how the wall on the right has been painted white to reflect the natural light from the tall windows on the left. 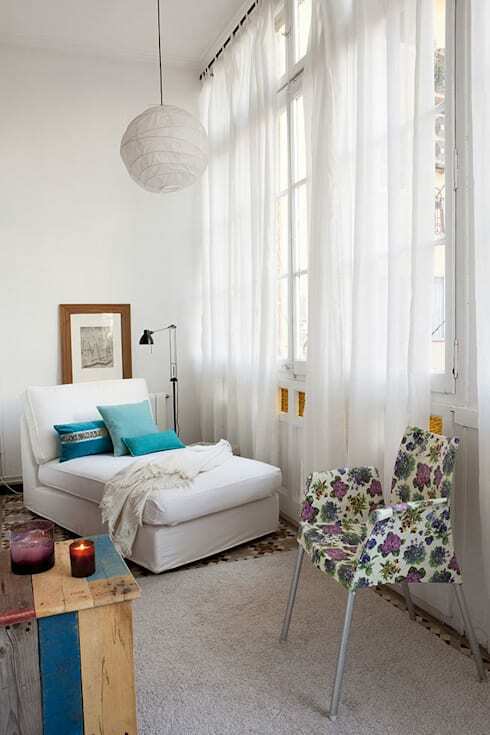 Spain is the home of the siesta, and this white chaise longue looks like a great place to relax! This may be a stately home, but there is nothing pretentious or overly formal about the furnishings. Just look at the standard white paper light fitting. This may be generic, but the designers have chosen this because it simply fits the feel of the space. The perfectly cosy bedroom is a great example of how to create a warm interior. It is replete with lots of varying textures, warm tones and has a fireplace. It is also interesting to see how both the bed and the rug have been placed at an angle to the wall. This turns the bed into a sort of centrepiece. It also helps create that sense of cosy comfort so important in a bedroom. There is a lot to love in this home and this view of the open bedroom storage unit is possibly our favourite. The large white pouf reflects the bold modern forms seen so often in the city, the gorgeous tall timber doors have our attention, and of course, we love the all-white decor. It can be hard to make open bedroom storage work without looking messy, so it's good to see how this unit has been arranged. Clothes with darker colours and patterns have been moved to one side. All the white clothes are grouped together to blend seamlessly with the white storage boxes and closed white shelves. 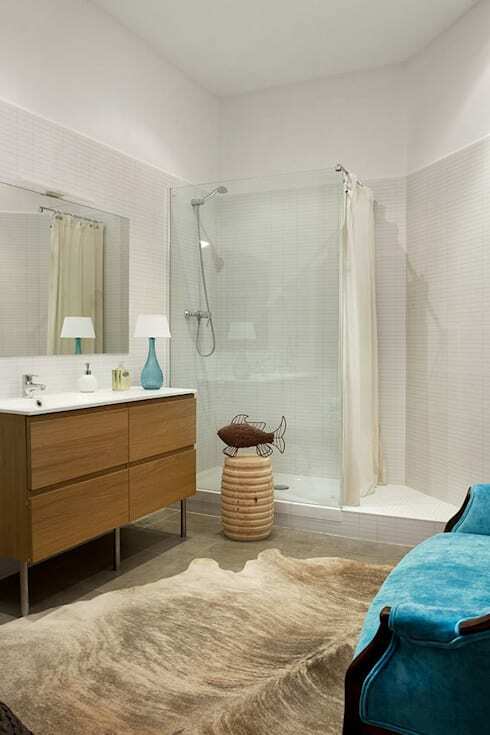 At first glance, the white bathroom looks modern and fairly standard. But then we notice the faux animal skin on the ground - and then the plush cerulean blue velvet couch! The bathroom is a rather odd shape, so it's great to see this space being used in such a creative way. If the open bedroom wardrobe has got you inspired, check out 10 incredible walk-in wardrobes. Which room in this stately Spanish apartment is your favourite? Let us know in the comments field below!